Anyone else having issues with spam showing up in the Xtra Webmail inbox? Forums › Spark New Zealand › Anyone else having issues with spam showing up in the Xtra Webmail inbox? I'd like to direct your attention to a new button! Step in the right direction, I'm very aware there is alot of push still on this end to work further on the spam filtering. I have been looking at the regex condition and it is quite powerful - if you understand what it can do. P.S any word on that other thing? Agreed, a step in the right direction. 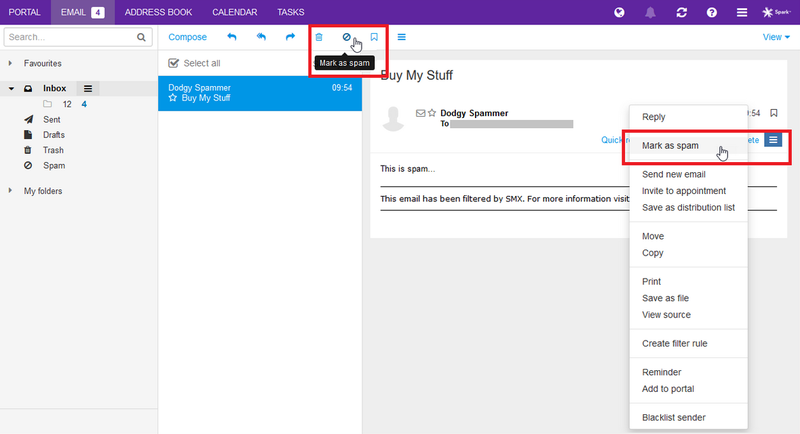 Showing in Xtramail, but not (yet) showing in Spark Business mail (also on the Open Exchange platform). There are, however, a few bells and whistles available to Business Mail users that aren't available to Xtra users. I'm a bit wary of the "Reject with reason" option - as much as I like the idea, informal tests I've done suggest that it's a good way of creating backscatter. Still on topic - sort of. I have a client who is getting continually banned from his @xtra email as he has had lots of emails from his address binned as spam by xtra users. The problem is he didn;t send the emails - so they must be spoofed from an external spammer but SMX is letting them through, accepting people marking him as a spammer and then banning him from using his own email. 1 - Ive been through all his devices, his web mail etc - there is zero evidence of any spam being sent in fact there would be a total of less than 50 emails in the last 5 - 6 weeks. Most to the same 10 people to complete a transaction. None are @xtra users he has sent to. This points to the spam being supposedly received from him being spoofed. 2- SMX should be junking emails from @xtra that dont come from their servers or at least have some kind of very strong dmarc / spf etc running to prevent spoofing. 4 - I understand SMX have guaranteed spam rates of less than 2 per 100k - they seem to be failing miserably at achieving this. 5 - SMX trying to achieve their guarenteed spam rates have dumped truckloads of legitimate emails but seem to be completely allowing low level easily filtered crud through. In one of my more recent interactions with SMX (haven't done so for a while) I got the sense that they thought that I was the spammer. I wouldn't be surprised if someone (or something) at their end is giving greater weight to "from" addresses and other easily forged details than would be justifiied. Hands up who has had a 'Access Blocked' Email around 10am pretty much every day for the past week from 'Kiwibank' spoofed .co.nz addresses with similar text in each message that would capture all..
*raises hand* - had "Access blocked" come in this morning, another "Kiwibank Alert- Unlock your access" yesterday, and another "Access blocked" on the 6th. All have been reported via Spamcop and assorted other reporting agencies (including Kiwibank), and moved to the Spam folder. I haven't looked for a pattern in the source of the last lot yet. I receive genuine emails from Kiwibank with the kiwibank.co.nz domain, but to an email address other than the one receiving the phishing attempts. The handful of phishing attempts I've actually looked at have been done in a way so it appears like the emails are coming from kiwibank.co.nz when viewed in Thunderbird or Webmail, but the (probably faked) "From" address is actually another domain. Update (Correction): the latest phishing attempts I've received use a (probably faked) communication.co.nz email address, disguised to display as a kiwibank.co.nz address. Sounds very much like nearly every address is getting the same one then. And yes, although from a NZ source (display as kiwibank) the messages themselves are originating from Brazil VPS server via Germany - same as I earlier indicated with the Blackhat SEO guys too. Fire up free trail VPS, spam to your hearts content. Fall off the face of the earth. If anything protection should be starting even at that level..
Isnt this the sort of thing any commercial spam filtering service should block? Its like they arnt really trying to block OBVIOUS spam & scams . Fun to pick holes at how slap-in-the-face some of the technical checks are failing. /edit.. I thought the .br domain was familiar looking from other messages..
Just a friendly reminder, don't blindly reply to spam requesting unsubscription from the mailing list. I've had a couple of unsubscribe requests come my way via mailing lists used by spammers. Off to Spamcop go the copies of the offending spam message, and the unsubscribe requests too. if examples of this are here, Please pass to me and i'll get them through to the guys..
Will need the details including Headers, Example emails, Target email etc. Been using the web-flag option/drag to spam from SMTP if it makes a difference already..
Account access=A0blocked due to a security violation.